While Las Vegas has been a nationwide leader for rent growth in the past few years, the progress made hasn’t been enough to push average effective rents ahead of the national average. Among the nation’s largest 50 apartment markets, Las Vegas has ranked alongside rent growth leaders in recent years. In fact, in 2018, the market tied with Phoenix as the nation’s #1 rent growth market, with a year-over-year boost of 7.4%. 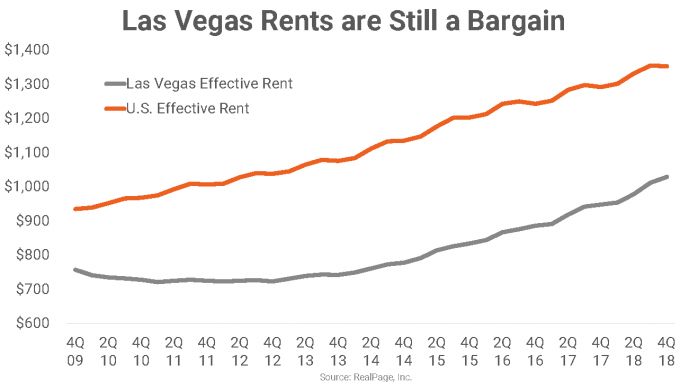 This is quite a change for Las Vegas, which is historically a rent change underperformer. 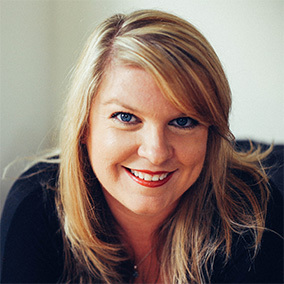 In fact, in 2011 and 2012, when the nation overall had pulled out of the recession and was raising rents once again, operators in Las Vegas weren’t yet out of the red, and continued to slash prices until 2013, when slight rent growth finally reemerged. It wasn’t until the last half of 2014 that year-over-year price increases started registering ahead of national norms. Since then, rent growth in Sin City has grown at a historically strong average pace of 6.1%, compared to a more moderate average increase of 3.7% in the U.S. overall. Despite all this recent growth, however, effective rents in Las Vegas are still relatively inexpensive, according to the latest RealPage Asset Optimization webcast. Monthly prices in Las Vegas came in at $1,029 at the end of 2018, more than $300 below the national average of $1,353. This relationship is on par with historical trends, as Las Vegas rental rates, even at the smallest differential, were still registering at least $100 behind U.S. prices. 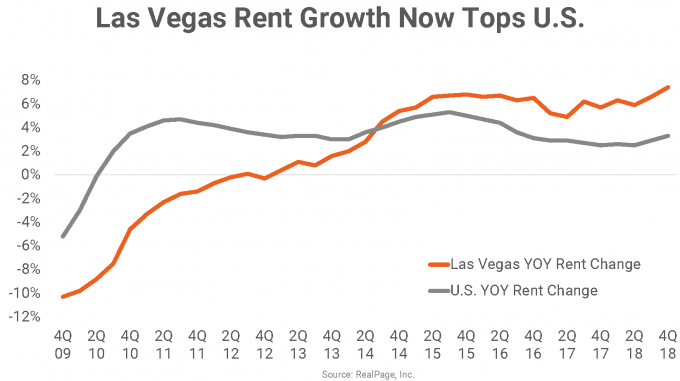 The wider gap in 2018 was the lingering result of the 2011 to 2012 period, when the nation overall was raising rents, while operators in Las Vegas were still cutting prices. Prices in Las Vegas’s Class A stock are especially low compared to national averages. The market’s most expensive product line averaged rents of $1,215 at the end of 2018, nearly $600 behind the U.S. norm. Las Vegas also has the smallest price premium for Class A units across the country’s bigger apartment markets. The Class A product line in Sin City commands rents that are only $173 more than the average Class B unit. On a national scale, that premium is closer to $500. This inferior pricing trend in the Class A stock is one of the reasons construction volumes have been moderate in Las Vegas during the country’s recent building cycle. Just a little over 18,000 units were completed here in the past nine years, increasing the existing unit count by a mere 8.3%. In comparison, the market was logging completions for roughly 10,000 units annually in the 1990s. 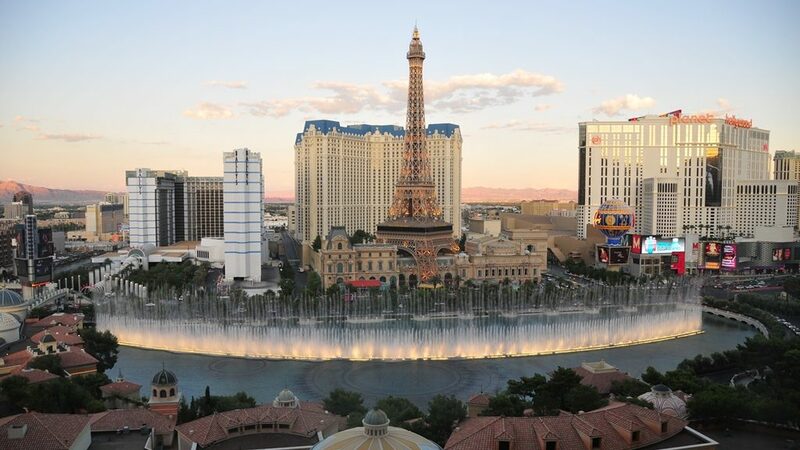 Looking forward, the delivery schedule in Las Vegas is expected to decrease further, allowing the Class A stock some more rent growth breathing room. Also holding back apartment pricing progress in Las Vegas was the Class C product line, which hasn’t fully recovered from its recessionary tumble. In total, during the current economic cycle, rent change in Las Vegas Class C stock is still down by 1.6%, which is contrary to the average upturn of 16% in the nation’s Class C stock. Occupancy in that more affordable product line in Las Vegas only recently returned to its pre-recession average.